Tying your own rigs is probably the most rewarding, relaxing and cost effective way of using rigs that suit your fishing, taking the fishing experience further than just fishing! But your rig will only be as good as the sum of it's parts, so why not give yourself the edge and use the best bits around! Streamlined, releasable bait clips that hold the bait close to the weight! Full Instructions avaiable! 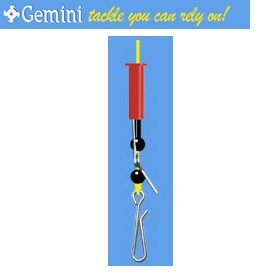 Looking to buy some Gemini as part of a fishing gift? If you would like some advice on purchasing Gemini, simply contact our expert fishing team, giving us either an email or phone number on which to contact you and we'll get back to you right away with the best advice and prices. FREE Delivery on all Gemini Gemini over £100!! !